Time for Sweet Punch !!! Yah this time it was fruit crumble. Any fruit crumble is my favorite. It is not only easy to make tastes so delicious too. Dessert that can be made in no time(Except the baking time). Goes well with icecream , Vanilla custard, dollop of whipped cream. Crumbles originated in Britain during World War II. Due to strict rationing the ingredients required to make the bases of pies contained too much of the necessary flour, fat and sugar to make the pastry. So a simple mixture of flour, margarine/butter and sugar was used to make the top of the crumble. The dish was also popular due to its simplicity. In some parts of America a very similar dish may be called a crisp. It is also similar to a fruit cobbler. 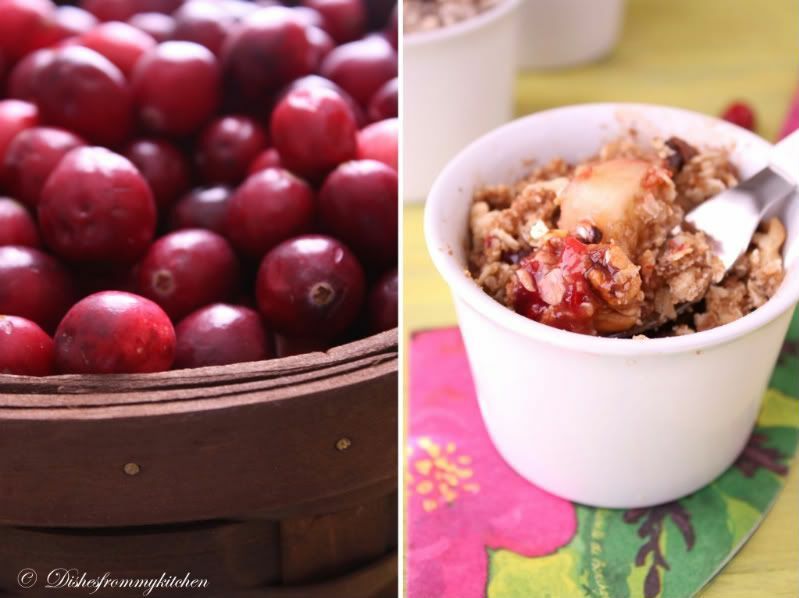 Popular fruits used in crumbles include apple, blackberry, peach, rhubarb, gooseberry, and plum. The topping may also include rolled oats, ground almonds or other nuts, and sometimes sour milk (e.g. vinegar and milk) is added to give the crumble a more extravagant taste. Brown sugar is often sprinkled over the crumble topping, which caramelises slightly when the pudding is baked. Hope you enjoy making and eating this simple yet delicious dessert. 1. Preheat the oven to 180°C, gas mark 4. Grease 6 ovenproof teacups or ramekins or a pie-dish. 2. 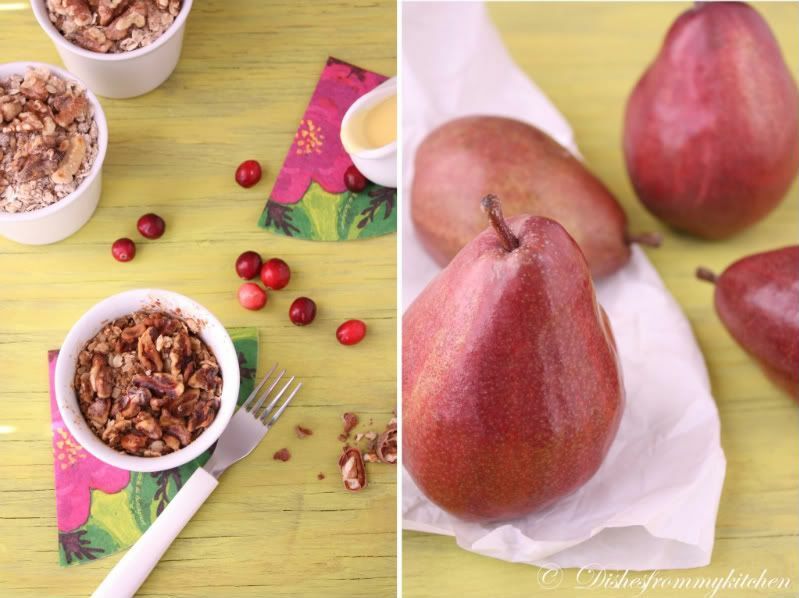 In a medium bowl, mix together the pears, cranberry, brown sugar, lemon zest and juice. Divide the mixture between the teacups or ramekins, spooning over any juice. 3. To make the crumble, place the flour, oats and butter in a medium bowl and, with your fingertips, rub together until the mixture resembles fine breadcrumbs. 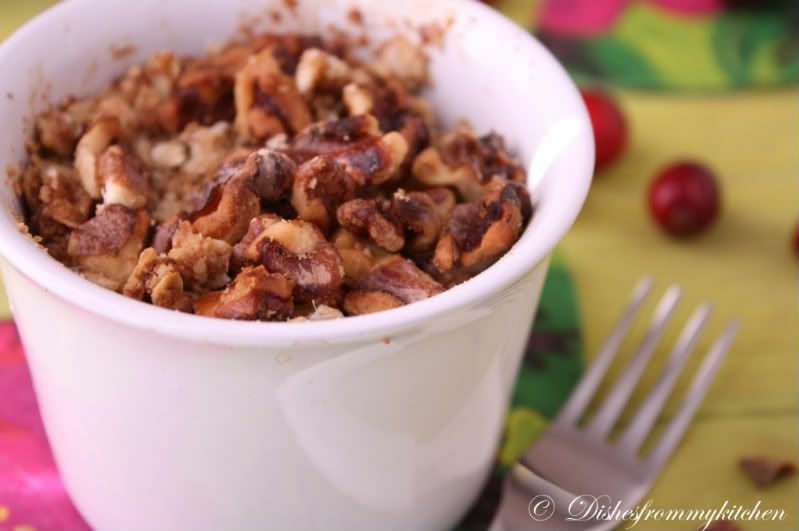 Stir in the sugar, Walnuts and remaining chocolate. 4. Spoon the crumble over the pears and press down lightly. Place the crumbles on a baking tray and bake for 30-40 minutes until golden and bubbling. Serve with a scoop of good vanilla ice-cream. 1. For the crumble part you can either use APF fully or 50/50 ratio of flour and oats. 2. 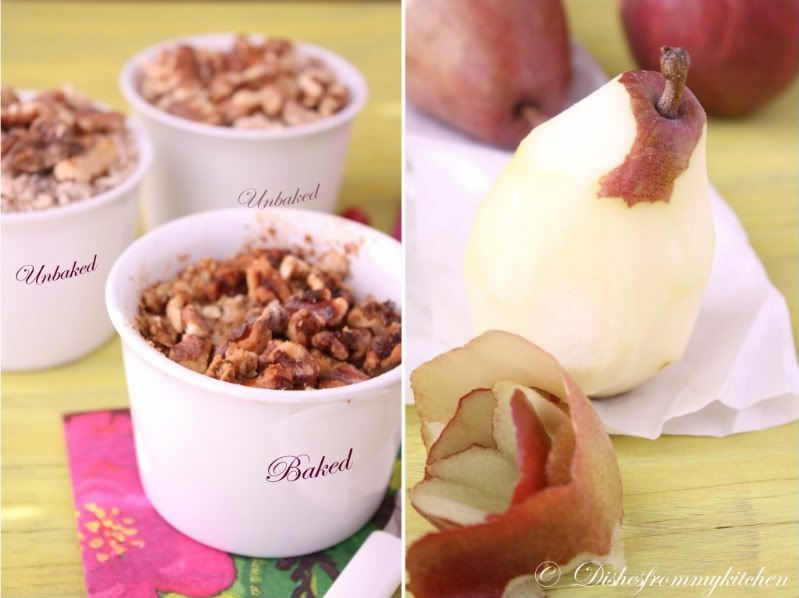 You can use any of your favorite nuts. 3. Substitute with any of your favorite fruit. 4. You can cut down the quantity of butter if you are concerned about the diet. Serve warm to enjoy the crispy topping !!! Beautifully done, Pavithra! 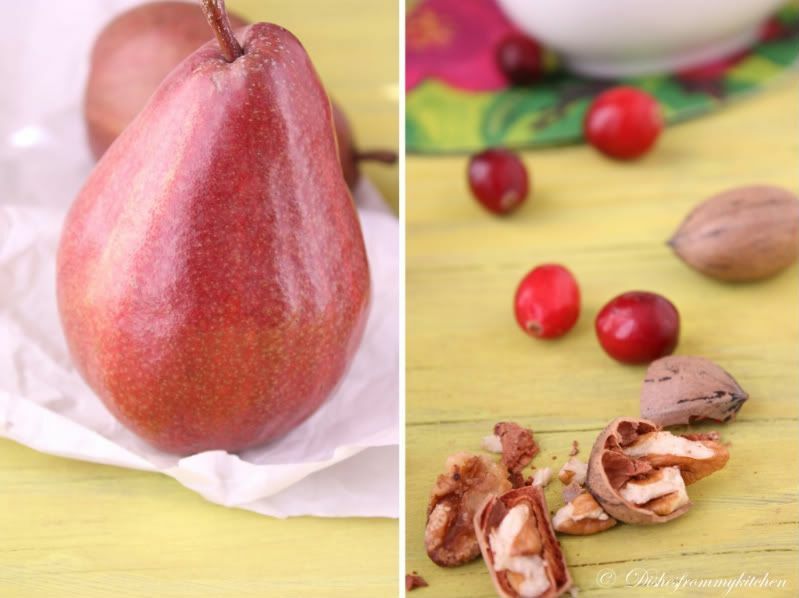 I loved your 'pear' pictures! Thank you for baking with us, dear! awesome PicturES.. i would love to have it with a scoop f vanill icecream..
Pavithra - this looks dashing! You and I think so much alike! I made this too this time and used cranberries and also oats and pecans for the crumble! LOL!! Of course - I'm in love with your pictures! Wat a beautiful and yummy crumble, extremely irresistible..
Wow looks yummy and tempting crumble.. Beautiful presentation. 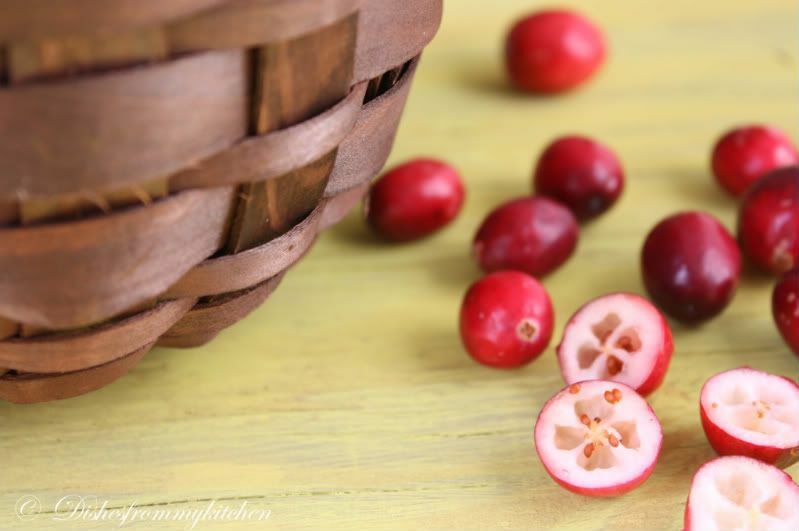 I loved your pictures and your idea of using cranberries that would have given it the tartness which I love.Will try your version soon. Looks lovely with all nuts and cranberries. 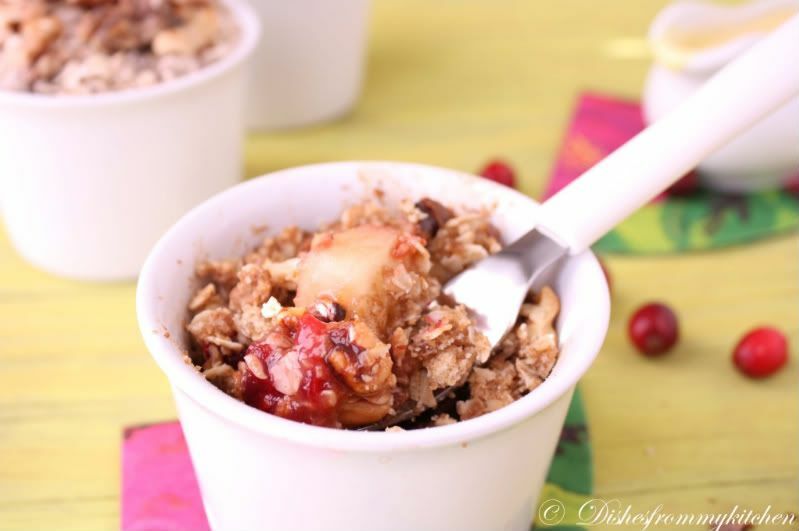 I just love the addition of hearty cranberries to this delicious crumble. Love love love your food photography :) and thanks for visiting my blog dear! Looks so tempting and inviting..love the pic,amazing. I have a question for you-- Where did you get that wooden plank? I see that everyone seems to one atleast one such plank and I am wondering where I can go pick one too. good idea to add oats! Mmmmm...a warm and cozy treat for the season!!! Oh my god pavithra the dish and clicks looks awesome. me and my daughter enjoyed a great visual treat.Wish u would have lived here in SG.Perfect one. 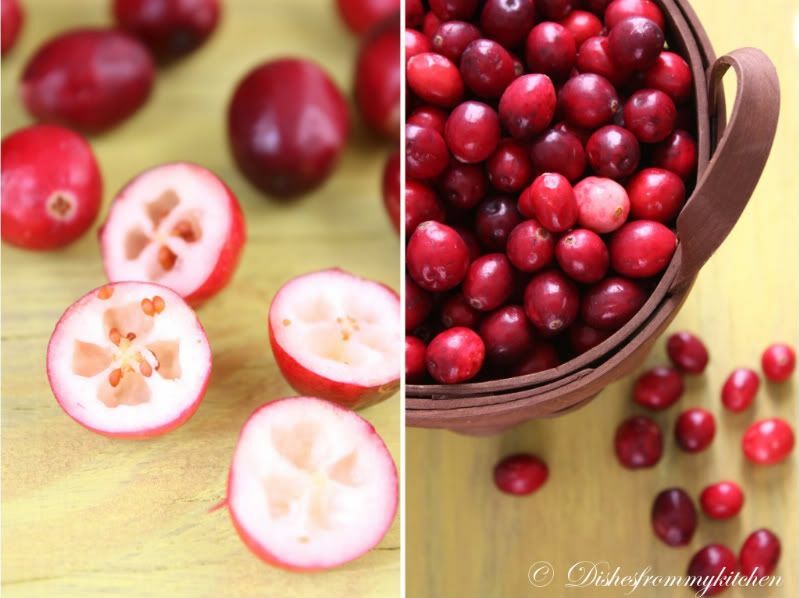 this looks stunning Pavithra cranberry pic's loving it! Lovely clicks. Thank you for visiting and you are right. You are my 100th follower. First time in your space. It is awesome! As always..lovely clicks.Looks absolutely delicious..Thank you for baking with us!! 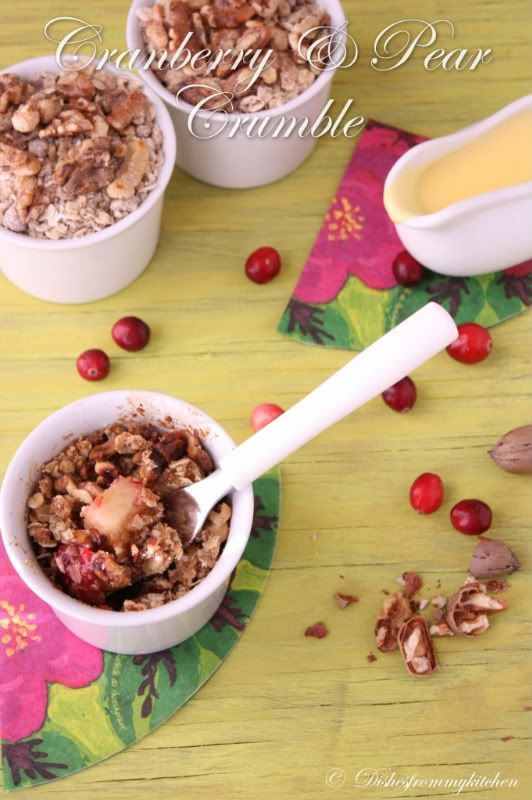 Wonderful crumble, nice clicks ! Delicous especially for these winter day. Awesome pictures..looks so perfect and yummy!! What kind of background is it anni?!! looks really good. This is yumm yummm yummy.. looks so delicious :) Love the first pic a lot. Beautiful crumble. Great photos. Great blog. STOLLEN - DARING TREAT !! !